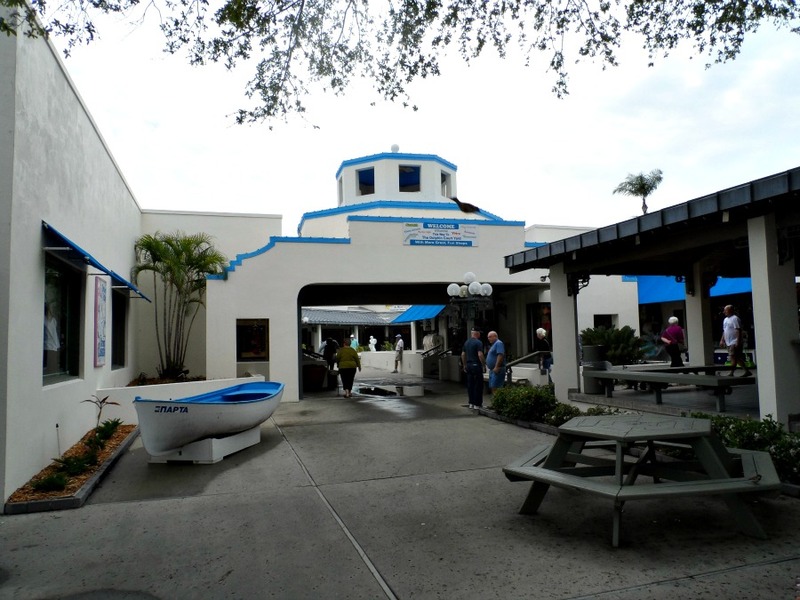 What a fascinating spot the Tarpon Springs Sponge Docks are. An amazing conglomeration of the authenticity a hard working sponge harvesting community and crass commercialism. 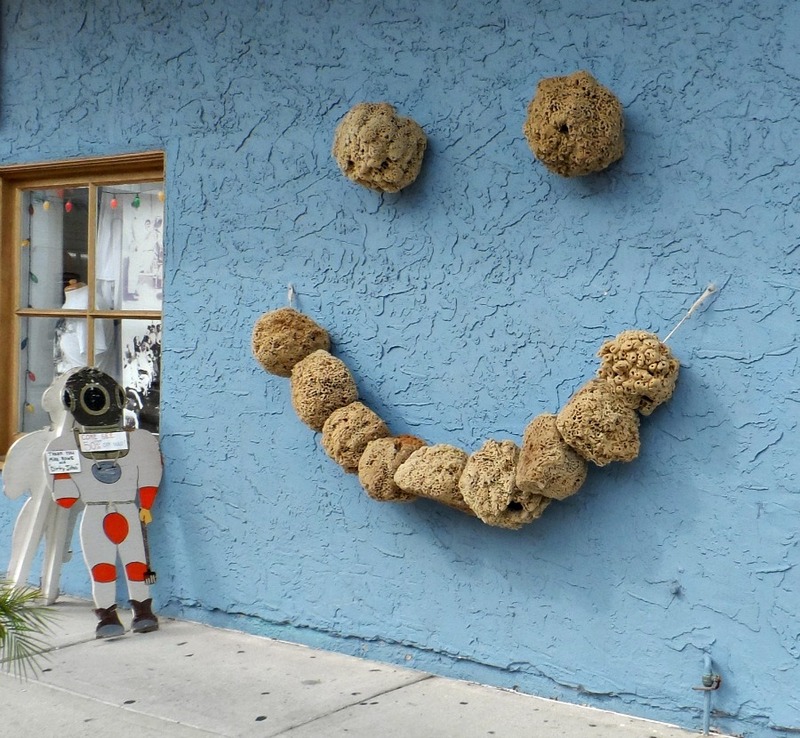 Natural sponges are actually living animals and an important part of Florida's coastal ecosystem, providing a habitat that is essential to a wide variety of marine life. 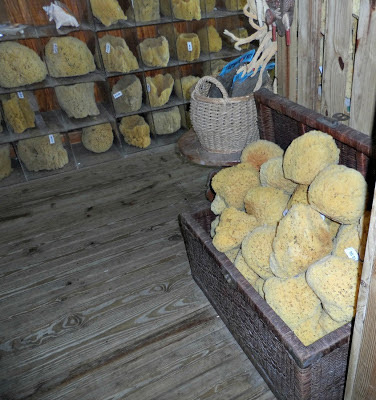 The discovery in the mid-1800s that Florida sponges could compete on world markets as bath sponges created a flourishing sponge trade in the Florida Keys where sponge harvesting started. 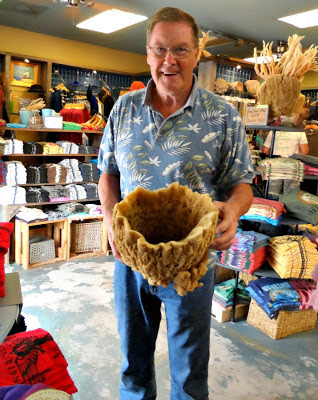 When we were in the Keys we found several small pieces of sponge on the beaches. 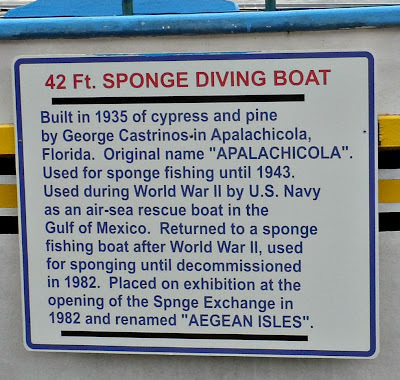 Eventually sponge harvesting expanded up the Gulf coast to Tarpon Springs, where Greek immigrants, experienced in harvesting sponges off the coast of Greece, were hired to work as sponge divers. 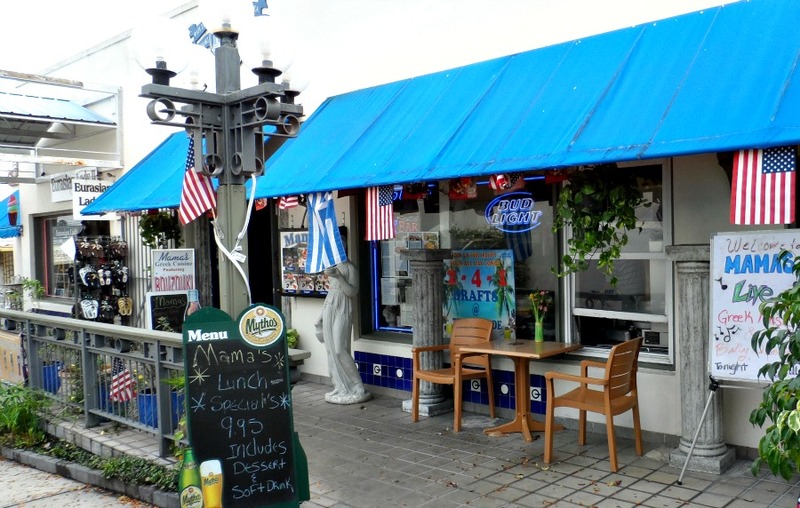 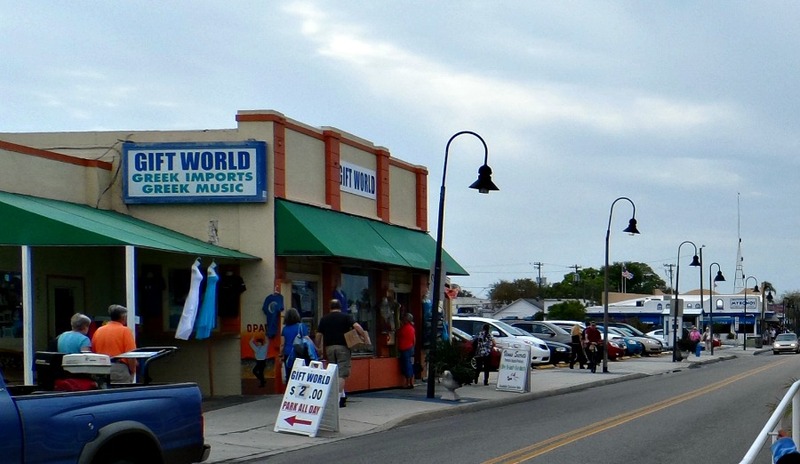 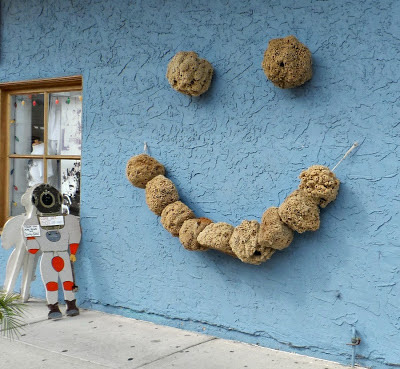 Today, Tarpon Springs is a community now famous for its sponge industry and history, Greek influence, restaurants, shops, bakeries and museums. And naturally we had to go and have a look. 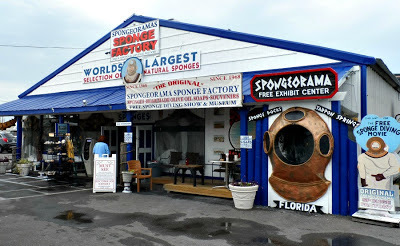 Right beside the dock was the sponge factory and museum which featured a movie showing how the sponges were harvested. 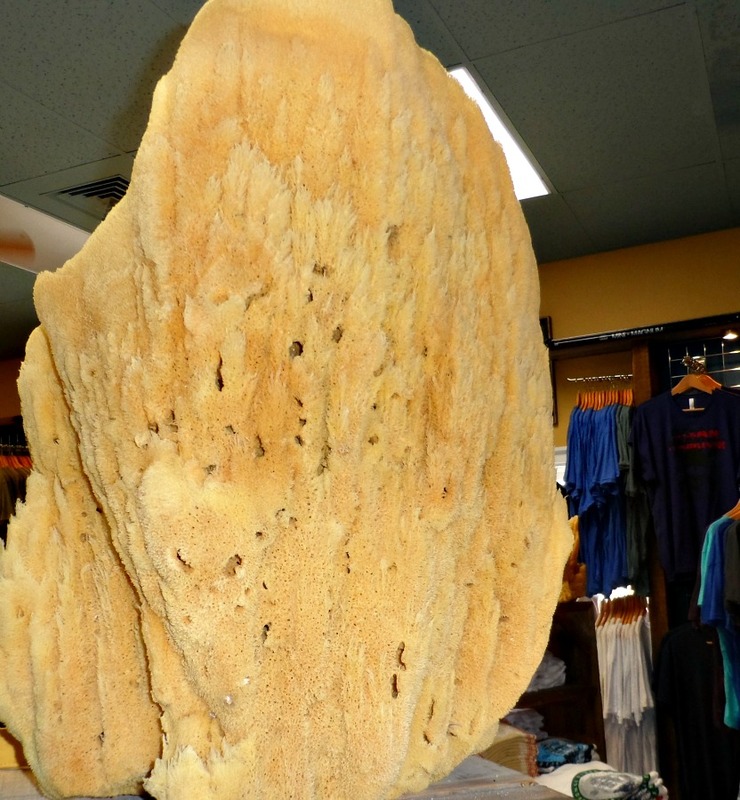 The sponges grow on the ocean floor. 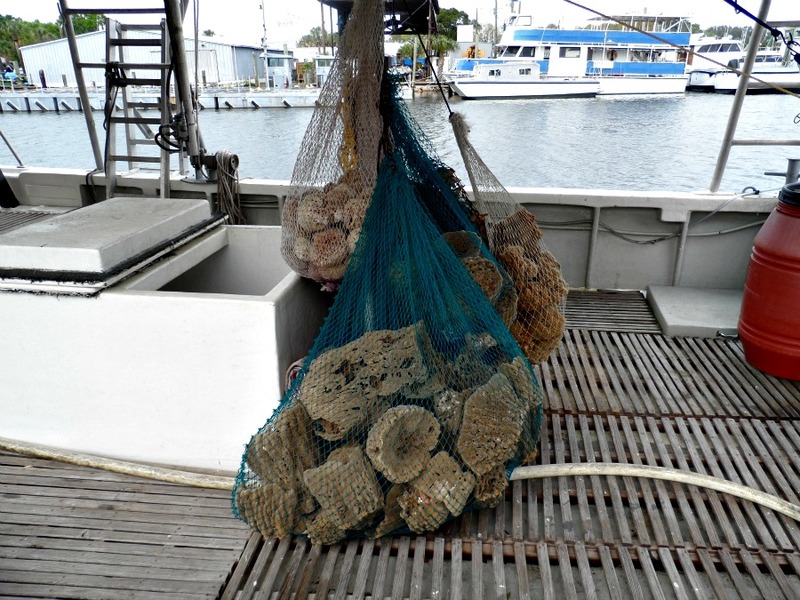 The divers use a cutting tool to harvest them. This tool leaves a little of the sponge behind so it will regenerate. When the sponges are first harvested they are covered with a black skin that must be removed. 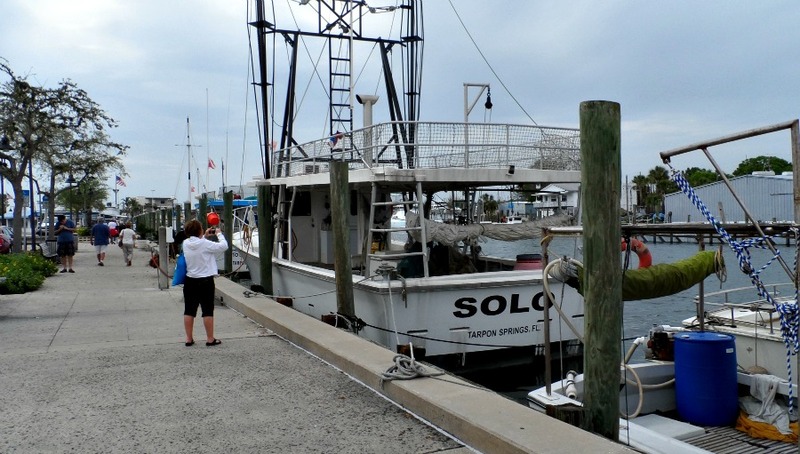 Cleaning the sponges requires several steps. 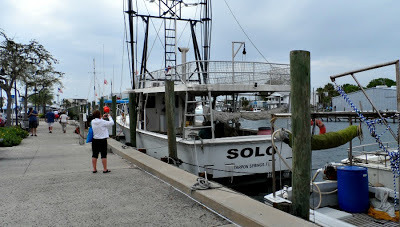 First, they are removed from the water to allow the living tissue to die. 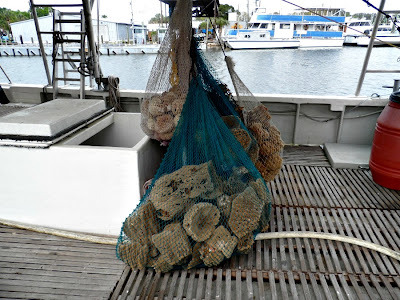 They are then stacked and kept under wet burlap to allow a rotting process to continue for several days. 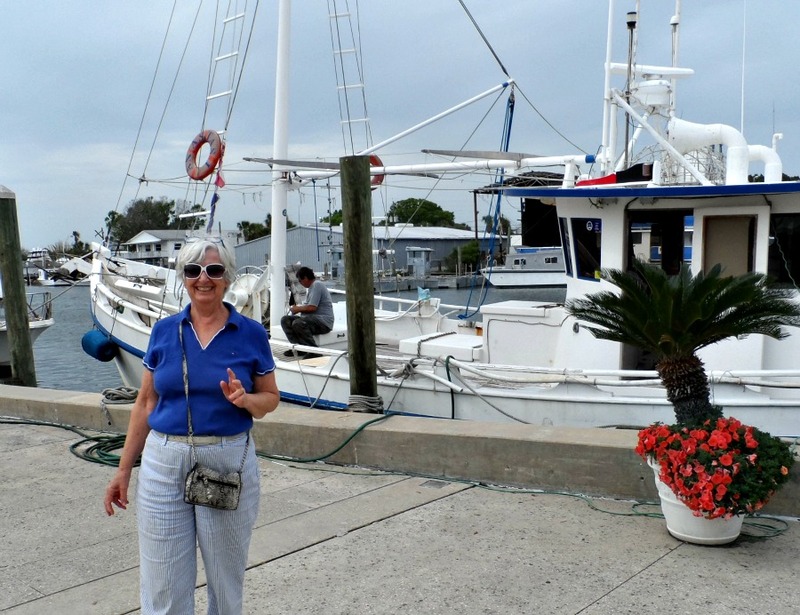 This helps in the removal of the outer “skin” and other non-skeletal tissue. The final step is to squeeze, or paddle, the sponges so the remaining skin and tissue is eliminated and only the sponge skeleton remains. 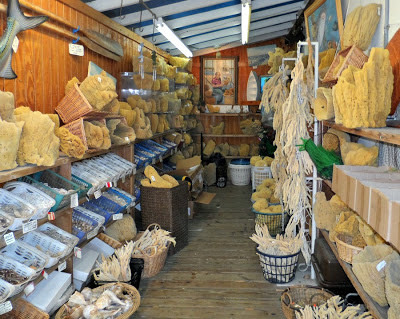 When totally dry the sponges are strung on ropes and sent to the sponge exchange where bidders examine them and bid for the ropes they want. 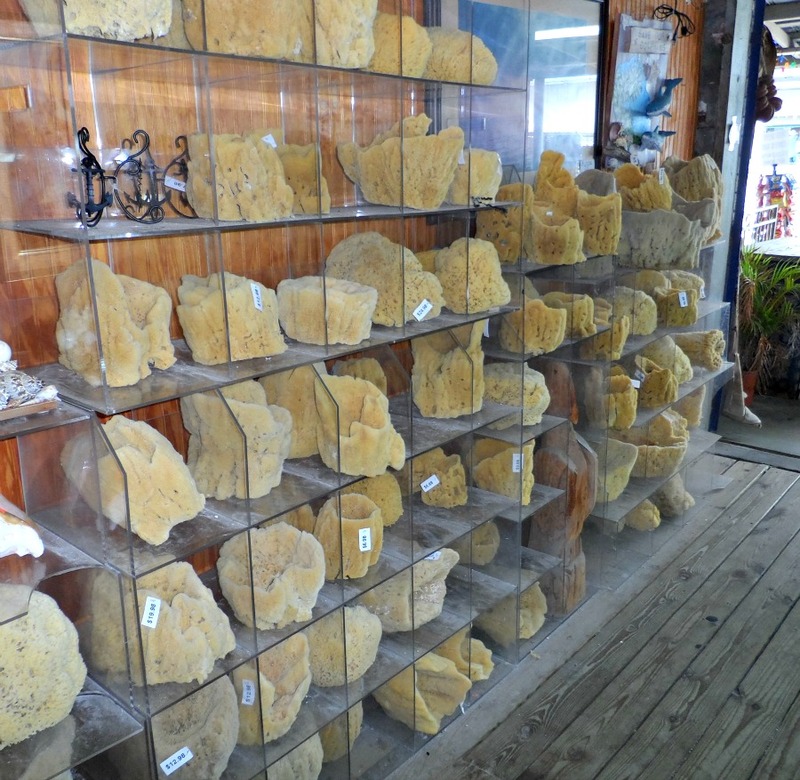 Price is determined by size and by how well the sponge has been cleaned. 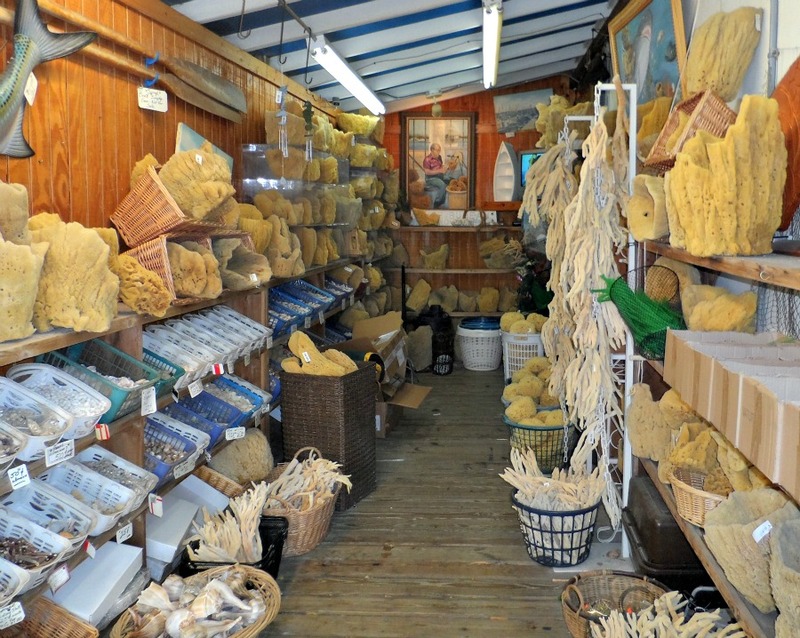 The purchaser then cuts and prepares the sponge for market. All types of sponges were on display and for sale. 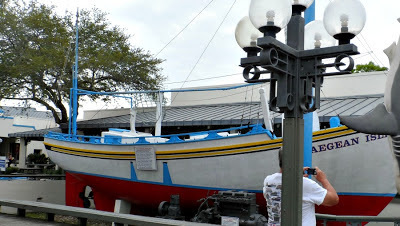 The traditional sponge diving boat above was on display. 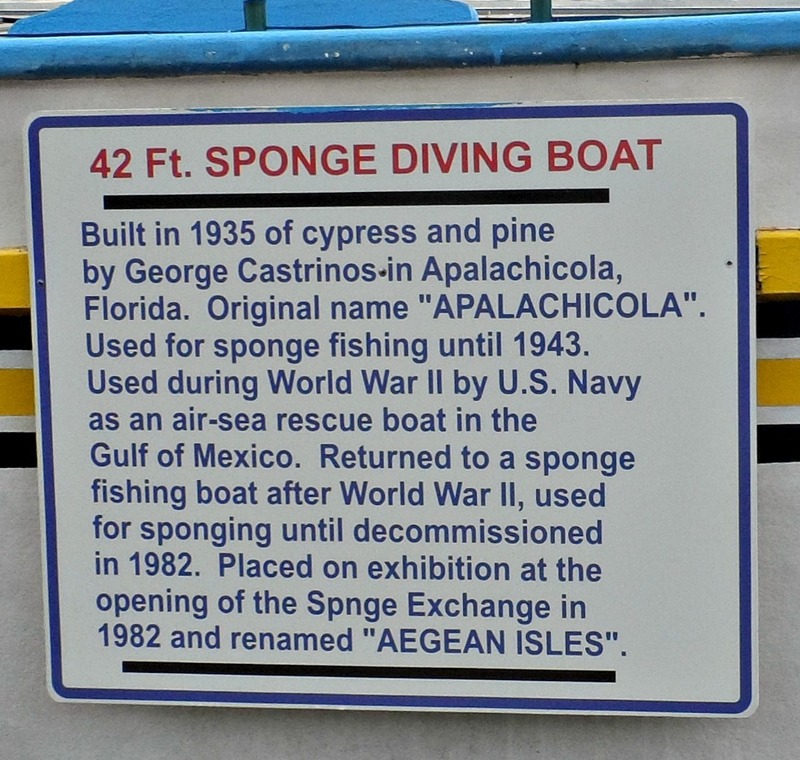 Do you see the typo on its plaque?